My big blue pot now. There are Narcissi still to come - they were meant to flower at the same time as the tulips! Beautiful - lovely combination like the tulips great shape to them. Beautiull Display Spritz, Love the colours.. Thanks - I am a great believer in getting as much as possible into a container! LOL. Lovely, what do you do with all the plants/bulbs at the end of the Spring, Spritz? That's lovely. I don't have tulips this year so I have to look at other people's. Last year I put them in a big box, let the leaves die back and then gave them away - but I've found an area in the garden where I can plant some,so that's what's happening this year! do you know which tulip it is? its similar to the one of the ones i cant identify. Yes - it's Albert Heijn...I think that's how you spell it! Wow, spectacular container. All in nice soft shades. This is really stunning, Spritz! Thank you all - I am waiting for the Narcissus to open now! I think they are cream. Thank you - I'll try to explain what I do. In the autumn, I choose bulbs which should flower at the same time, with one type a little taller than the other. I plant them in layers, of the same bulbs on each layer, close together, with compost on top of each layer. On the top I plant a central small conifer or upright grass and winter pansies which look good right through the winter. Then the bulbs come up and there we are! Does that make sense? thanks spritz but it isnt the one i have. mine is more peachy. i will identify it one day! looks lovely in the blue pot.. 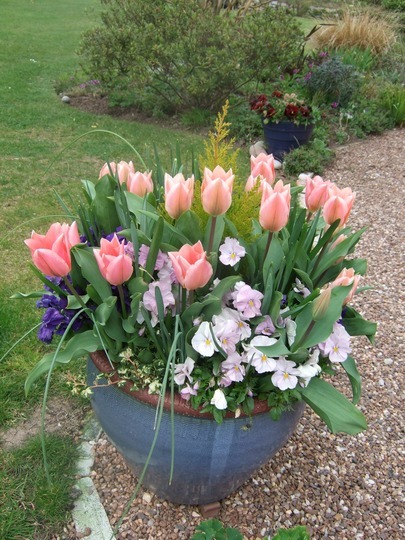 In there this time round are orange tulips, 'Orange Emperor', cream and deep orange Narcissi 'Parisienne', some white Scillas, and the top layer is a central Cupressus with Pansies 'Amber Kiss' around it. I will be taking photos in the spring....you'll see more of my BBpot! Watch this space! LOL.